Years ago, I began motor sailing after losing the wind. Although drowsy from the midday sun and the boat’s gentle motion, the mate and I recognized that the sailboat’s steering was getting heavy. I pulled myself up from my cozy nest, had the mate take the helm and lifted the engine room hatch to find disturbing news: We were taking on water at an alarming rate. The hose connecting the flexible stuffing box had split. To replace this hose, you need to remove the propeller shaft. Since we didn’t have the time or facilities, we needed a temporary fix, right away. When I was young, my father had kept his old Ford tractor working long after its time. When he had a hose problem, he would split a piece of another hose, wrap it around the damaged portion and clamp it in place with bailing wire. Having learned that lesson, I always carry an old inner tube and magnet-tested hose clamps. To clear a working space, I rigged the oversized pump I carry for just such emergencies. For the temporary repair, I wrapped a piece of tube around the damaged hose and clamped it in place. Thankful that this occurred during calm seas, we continued on our way. On an earlier cruise, I had learned the hard way to carry an oversized bilge pump. My boat had been pounded in a hard cross chop for some time. The pounding loosened the fittings that held the grounding plate to the outside of the hull. Seawater flooded the boat, overwhelming the small bilge pump I carried at the time. We removed the intake side of the engine cooling hose and stuck it in the water. Of course, the engine had to be running. Bilge refuse quickly clogged the water jacket and destroyed the pump’s impeller. The engine started to overheat. About 200 nautical miles from the nearest land, we were in real danger. We installed a spare impeller that allowed the engine to run at a low RPM. This kept the boat out of the trough and kept the batteries charged so the bilge pump could run. Applying some underwater putty from the parts locker slowed the inflow of water enough to control that problem. We trimmed the sails and limped along our not-so-merry way. 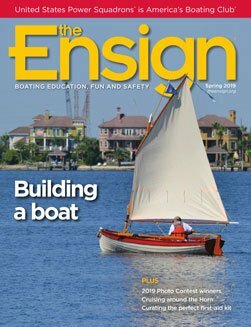 Using the engine pump to dry the bilge isn’t a bad idea if you are prepared. We now have a piece of nylon screen and nonmagnetic hose clamps taped to the hose just in case. Replacing the manifold and cleaning the engine cooling system kept us ashore for an entire year. An expensive lesson, to be sure. P/C George Shaw, JN, of St. Lucie River Sail & Power Squadron/8 has been a single-handed blue-water sailor most of his life. As a youth, he learned about USPS when a friend got him into New Haven Squadron’s Celestial Navigation class. He has supported safe boating ever since. An earlier version of his article appeared in his squadron newsletter, Crossroads.